Ancient Evil is the second DLC map for the Zombies Mode of COD: Black Ops 4. The community loves elaborated and challenging Easter Egg that play a pivotal role in the map’s story and Ancient Evil is no different. Follow our Black Ops 4 Zombies Ancient Evil Easter Egg Steps Guide for detailed, step-by-step instructions on how to proceed through all the environmental puzzles in order to complete the Easter Egg and mark the conclusion of this DLC stage. Like all preceding main Easter Eggs associated with Zombie Mode, there are a lot of secrets to uncover, a lot of places to discover and a bunch of tasks to be completed. Ancient Evil is no different in this regard, as the hunt still continues. Although the Black Ops 4 community isn’t as healthy as it was at launch, passionate fans have been ever so active with the game and an Easter Egg that are associated with it. “In Ancient Evil, finish what was started”. Obviously, one cannot possibly figure out a single thing based on that information. We know, as per tradition, that when the Easter Egg hunt is completed, the final cutscene will play out that will conclude the events for the Ancient Evil stage, concurrently bringing closure to the narrative of the Greek setting. Firstly, you’ll need to take part in and complete around 6 Oracle Tributes found throughout the map. These mini-games have certain objectives like killing X number of zombies within a set amount of time, etc. The actual number of challenges to be taken up can vary according to the difficulty. Therefore, continue to take the challenges until the flame in Apollo’s Temple will turn blue. At this point, you’ll need to use the Spear of Apollo’s Will Weapon and melee the blue flame at the temple with it. In the Intersection of Treasuries area, move near the red tent. Here, the stain lies on the wall next to the tent. Lastly, move to Spartan Monument and look for the statue here. The oil stain is on the wall adjacent to the statue. Between the two statues upstairs in the Upper Road region. The stain will be on the rock right betwixt the statues. Once you’ve ignited all these stains of oil using the same Spare of Apollo’s Will, a beacon will light up. This will indicate that you’ve successfully completed this task and you can now move to the next step. Heading to the Spartan Monument, you’ll be able to observe a blood-red projectile amidst the many statues here. Use your Redeemed Hand of Charon while standing in front of the statues and shoot this red blob. Fight off some zombies before you need to perform one more step. While standing on the exact spot of this blood blob, use the Hand of Charon to shoot uncharged projectiles at the head of each of the statues with glowing green eyes. Next, look for three precise bricks in walls where there are hidden cogs situated. Although we’ll reveal the locations below, the indication of such walls will be given via faint blue glimmer of lights on the walls. At the Spartan Monument, in the wall right next to the statue wielding a spear. At the Intersection of Treasuries, in the wall of the tomb building. The wall you’ll be targeting will be right next to a red tent. There’s a second one in the same area of the map. You will need to head to the Auger wall buy house. The cog is in a wall to the left of this wall buy spot. After revealing each respective cog, use the spear to jam the cogs that will put the statues in a spinning motion. These statues that we’re referring to are situated in Stoa of Athenians. Therefore, head there and wait until all the statues face inwards. Now target the pillar in the middle (behind the crystal) of the three statues to project several flaming spears at it. This will raise the pillar and the statues will align so that the light intersects. Make your way to the Intersection of the Treasuries to locate a giant red chaos crystal that contains an object inside, the Ankh. Luring a Gegenee mini-boss towards the crystal, his shield blast attack will un-tether the Ankh so you can claim it. Defeat the mini-boss and place the Ankh as well as the Redeemed Hand of Hemera in the statue of Ra situated at the Gymnasium Bathhouse. These actions will result in a beam of fire while skeletons will try to deflect the beam. Fight the skeletons off and the beam will hit a precise spot that reveals a secret chamber. Head inside, retrieve the Scepter of Ra and place it in the Statue of Ra to complete this part of the step. Hang on; we still have some steps before solving the Easter Egg. Moving to Offering of the Attalids area, locate the black branch/vine shape with the green glow to the left of the Statue of Danu. Two more can be found near the top of the statue. Use the Redeemed Hand of Gaia to shoot these shapes in quick succession. Continue shooting the nearby vine shapes until the Gegenee mini-boss spawns. Eliminate the enemy to obtain a pole. Make your way to the large sundial symbol located on a floor within the Offering of the Attalids area. Move to the center of the sundial and place the pole there that will reveal a yellow shine behind it. Soon after, you will face an electric zombie on the sundial. Kill it to activate the sundial and kill another one to set in a motion another dial that starts rotating. Therefore, the two dials next to each other should both be blue at the time of shooting the rotating dial. Repeat this for the other two inner dials as well. If you fail, a white flash will occur on the screen meaning you will have to repeat the steps above again. Succeeding in the task will allow you to move forward to Amphitheater. Making your way to the Amphitheater, you will observe multiple colored circular patterns on the floor. The different colors correspond to the different Wonder Weapons so have your teammates stand at the right spot with the right weapon. As soon as the circle starts to glow, the challenge will start so each player will need to eliminate highlighted-zombies corresponding to the color of the circle. Since enemies will come from various angles and distances, it’s advisable to utilize both the charged and uncharged variations of the projectiles of the wonder weapon. Three rounds of this challenge will need to be completed for the step to have been successfully finished. Head to the River of Sorrow and interact with the door to the right of the Spitefire wall buy here. The numbers are then to be inputted (shot at) in the same sequence as that shown in the intro cinematic for Ancient Evil. Here is the sequence if you don’t want to go back and watch the cutscene. Whosoever is playing the character of Stanton Shaw will need to interact with the door to trigger a cutscene. Once the scene is over, head upstairs at the River of Sorrow to place the Pegasus Strike on the glowing blue symbol right on the stairwell. This will spawn a Ballista Crossbow at the bottom of the staircase. Fire charged shots of the Redeemed Hand of Ouranos at the Ballista while you’re standing at the spot of the Pegasus Strike. The crossbow will then align so that it faces the Python. Now head to Apollo’s Temple and melee the blue flame using the Apollo’s Will spear so that it turns blue. Next, use the Venom Traps over at Python Pass to turn your spear’s tip green. Finally, head back and melee the Ballista with the spear so that it’s ignited. This, in turn, will create the portal to the final boss fight, the end of the Easter Egg. The announcer will also mention something about an entrance to Mount Olympus being created. To access this portal, move to the Center of the World and prepare yourself for the boss. The fight takes place at the Mount Olympus arena region while the Fountain and the Forest are also accessible. In the start, you’ll face an evil Pegasus which takes multiple shots to fall down at which point you’ll need to use your Specialist/Wonder weapon to deal decent damage. This will require multiple reiterations before Pegasus is taken care of. The level will only continue at the Columns of Mount Olympus where Perseus absorbs the remains of Pegasus and becomes the last standing warrior that you’ll have to face. Avoid his lightning strikes by moving away as soon as it’s struck. This is because Perseus teleports to the location of this lightning as soon as he sends it down. At the opportune moments, shoot down Perseus so he falls down to his knees at which points you and your teammates can deal massive damage with the Wonder Weapons you’ve equipped. Continue this exchange multiple times until you’ve whittled down Perseus’ health entirely. When he’s eliminated, grab the key that he drops. At this point, the final cutscene for Ancient Evil plays out and marks the end of the story and the Easter Egg for the particular stage in COD: BO4 Zombies. 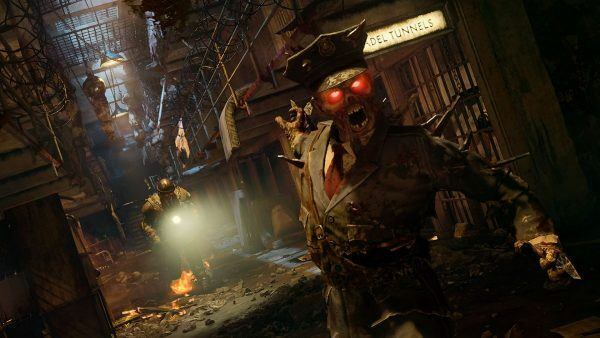 The post Call of Duty: Black Ops 4 Zombies Ancient Evil Easter Egg Steps Guide appeared first on SegmentNext.